Posted August 5, 2016 by William Martin & filed under Galleries. The second block of filming for the new season of Doctor Who began this week in Cardiff. 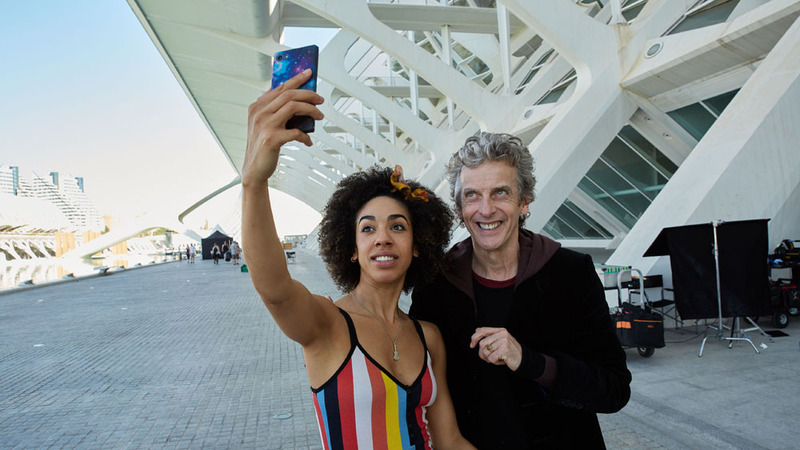 Peter Capaldi and Pearl Mackie, who play the Twelfth Doctor and new companion Bill, were spotted in period costume shooting scenes for what is believed to be Episode 3, written by returning writer Sarah Dollard, who wrote Season 9’s ‘Face the Raven’. Several photos of this week’s filming have been posted by fans on Twitter. Block 2 is directed by Bill Anderson and also includes an episode written by Doctor Foster creator Mike Bartlett. The first two episodes of Season 10 wrapped last week with several days on location at the City of Arts and Science Museum in Valencia, Spain. Season 10 began filming in Cardiff in June and will air on BBC One in spring 2017. I do hope so! The whole Gang is great as a team, but I especially like Madame Vastra and Jenny. It is great how both those characters are created and both actresses are doing such a great job bringing those characters to life. I especially hope to see them at least once again in the upcoming season, while the current showrunner is still on board. Their presence would fit with the tone of series ten, which appears to be more lighthearted than last year. Just as long as there’s a good enough in-universe reason to bring them into the story then I would be very happy with that. Peter Capaldi REALLY suits the Victorian dress style. Dr Who season 10. Not want. NEED !!! Anyone see him in an adaptation of ‘A Christmas Carol’ as Scrooge? I was just at the City of Arts and Sciences a few months ago. My first thought upon seeing it was that it looked like an enormous standing set from a 1970s science fiction show, so hearing that Doctor Who filmed there makes me very happy. Also, if you ever get a chance, go to Valencia and see it. It’s pretty amazing.